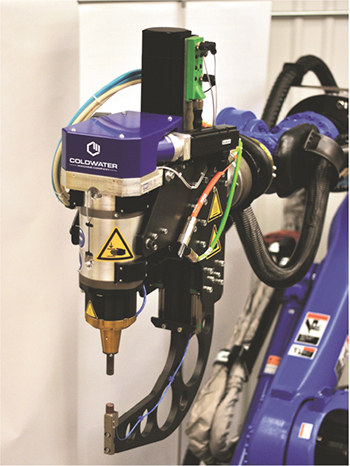 The new SpotMeld system from Coldwater Machine Co, Coldwater, OH, reportedly enables spot welding of 1000- to 7000-series aluminum, magnesium, non-ferrous and dissimilar sheet materials, offering an alternative to single-point joining processes such as resistance spot welding, laser welding and riveting. SpotMeld, based on refill friction stir spot weld (RFSSW) technology, uses rotational friction to heat the materials along with pressure to forge the parts together using wear-resistant tooling. In practice, heat generates between the tool and material, creating a soft region. Pressure then yields a solid-state joint. In addition to its ability to join dissimilar and lightweight materials, benefits reportedly include high-quality joints with a small heat-affected zone, consistency in weld duplication and faster weld times. The process, note Coldwater officials, also is environmentally cleaner and safer with no filler material, spatter, smoke, radiation or shield gasses. SpotMeld friction-stir spot welders can be configured to application specifics and mounted on any industrial robot, with a variety of weld recipes available on demand via the robot controller.